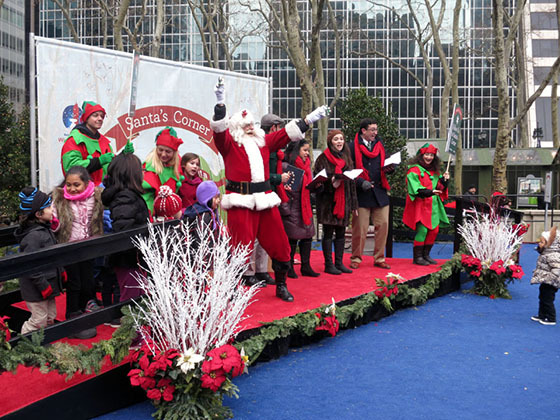 Bryant Park Blog: Santa's Corner is Coming to Town! Santa's Corner is Coming to Town! Santa returns to Bryant Park this year on December 18th, once again taking up residence on the Deck at Bank of America Winter Village. Santa's Corner will feature opportunities for picture taking, caroling, and merriment all around. Featuring a beautiful hand-painted throne and scenic winter backdrop, you'd be excused for confusing the park with the North Pole. There are two ways to grab a photo with Santa this year. Bring your own camera or cell phone, and snap your own pic; or have a park representative with a professional camera take it for you, and we'll upload it to our Flickr page so you can download it later at home. Santa with his elves and a group of carolers rounding out the Christmas Parade. A new event this year features elves handing out free holiday-themed postcards and coloring supplies so that children can color postcards and write to Santa. On Dec 20 and 21, Daniel Hertzberg, the illustrator and graphic designer who creates many of the wonderful images throughout Winter Village, leads holiday drawing workshops next to Santa's Corner. The postcards and workshops are made possible by Bank of America. Be sure not to miss our annual Christmas Parade, where Santa, his helpers, and a host of carolers march around the park rounding up revelers and spreading good cheer, on opening and closing day, the 18th and the 24th from 1:00-1:30 pm all around the park.